Using our mxODBC Zope DA™ for Plone, you can connect your Plone CMS installation to all ODBC compliant databases and data sources - in a hassle-free, robust and scalable way. The mxODBC Zope DA™ for Plone product allows you to easily connect your Plone 4.0, 4.1 or 4.2 CMS to just about any database backend on the market today, giving you the reliability of the commercially supported eGenix.com product mxODBC and the flexibility of the ODBC standard as middle-tier architecture. mxODBC Zope DA for Plone works on Windows, Linux, Mac OS X, Solaris and FreeBSD, providing you with the same interface, flexibility and robustness across all on all these platforms. The mxODBC Zope DA for Plone implements thread-safe connection pooling and multiple physical connects per logical Zope connection. You can safely run Z SQL Methods in parallel, achieving a much better performance than other Zope database adapters under heavy load. This makes it ideal for deployment in ZEO Clusters and Zope hosting environments where stability and high performance are a top priority. We have integrated the Plone installation system compatibility into the mxODBC Zope DA itself, making the installation of the Zope DA just as easy as the installation of Plone itself. Please download the mxODBC Zope DA Zope 2.1 product from the mxODBC Zope DA for Zope product page and install it as described in the documentation. We have added a special section specifically for Plone installations to make this as easy as possible. Licenses bought for the mxODBC Zope DA for Zope 2.1 are also usable for Plone installations and valid for one Plone instance each. 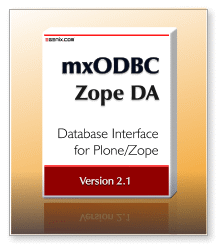 The mxODBC Zope DA 2.1 is compatible with Plone 4.0, 4.1 and 4.2.